Charles Edward V. Draper was born October 18, 1855 at Phelps, N.Y., the son of Valney V. and Elizabeth (Sherrell) Draper. The family moved to Marshalltown, Iowa when he was eight years old. Charles attended grade and high school there. His father was a merchant/tailor. The family also ran a boarding house. Tenants included both Tabitha Rice and her brother Ezekiel, a lawyer, also from New York. 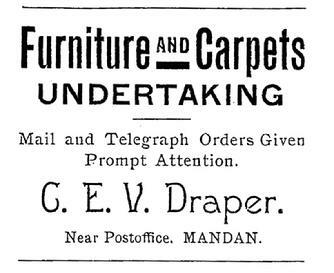 Mr. Draper was associated with the telephone business since its invention. In 1874, it was first discovered that sound waves could be conveyed over a thread of string line with a paper diaphragm. Draper was at the time a telegraph operator at Gilman, Iowa. In his small apartment over the bank, he built a telephone system of his own. When local businessmen heard of the device, they paid to have him install it in their homes or places of business. By 1876 he had installed a telephone switchboard, connecting several residences, stores and the bank with a �central� at the railroad depot. The installation of this acoustic system was done two years before the construction of the first commercial switchboard at New Haven, CT on June 28, 1878. He later installed a telephone line in Marshalltown, where his parents still lived. After about 6 months, the novelty of his telephone inventions had worn off and it had became "work." He enrolled at Iowa State University, graduated in 1881 with a law degree, but never practiced as an attorney. In the fall of 1881, he accepted the position of manager of the Western Union Telegraph Company in Bismarck, ND. While in Bismarck, he met Hattie Lounsberry, daughter of Colonel Clement V. Lounsberry. Lounsberry established one of the first newspapers in North Dakota, The Bismarck Tribune. The couple would be married on October 1, 1884, and be blessed with two daughters, Olivia Medora and Elizabeth Lucretia. Mr. Draper is credited with being the first owner of the telephone exchange in Bismarck and installing the first telephone ever used in North Dakota in 1881. He connected the Bismarck and Franklin Hotels in Bismarck, which were about five blocks apart. The phone on either end of the single line were acoustic phones operated with the addition of a copper wire covered with cotton to carry the sound waves. In 1883 he secured the telephone franchise in Bismarck, Mandan and Fort Lincoln. In 1885 Mr. Draper installed the first long distance line in North Dakota from Bismarck to Washburn. Later a second line was added to Painted Woods a settlement about 10 miles north of Wilton. In 1885, they relocated to Minneapolis where he was employed for a brief period with the Postal Telegraph Company. Draper would later move to Canada where he installed the first duplex and quadruplex instruments between Winnipeg and British Columbia, remaining in that connection for about five years during which time he had charge as circuit manager of the lines between Brandon and Medicine Hat , the division later extended to Donald, British Columbia, covering nine hundred miles of route and over thirty-five hundred miles of wire, which was the longest route on record under the direction of one man. He left that position in 1890. Mr. Draper�s parents came to North Dakota with him in 1881 and became members of Mandan's Episcopal Church. 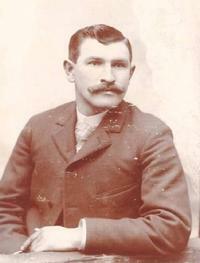 His father Valney returned to the mercantile business and operated a store in Mandan for several years. Draper's sister Olivia Mary (who would later refer to herself as Mary to avoid confusion with her niece Olivia) would marry to E. C.(Ezekiel) Rice, the attorney, who would also serve as Morton County States attorney. 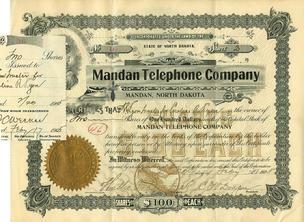 In 1900 Mr. Draper organized the Mandan Telephone Company. In 1906 this company was reorganized and the exchange completely remodeled, the old equipment being discarded and the first full harmonic exchange in the northwest established. Mr. Draper was president and general manager and majority stockholder. He sold the franchise back to the Bell Telephone Company in 1916. He installed exchanges in Bismarck and Mandan for Bell, acting as manager for both exchanges. He had to give up the business because the rates were too high and subscribers disconnected the service. Both cities cancelled the franchise and ordered the poles removed. Draper installed the first electric arc search light in Dakota Territory on the steamboat “Dakotah” servicing the Missouri River. Mr. Draper also invented several instruments to do with the telephone and electrical equipment. One of these, an electrical alarm system for giving the alarm on steam whistles, was in operation in Mandan for 43 years. Operators at the telephone office central could push a button to start the first single long blast of the city's fire siren. Design and operation of the telephone system and fire alarm were not the only systems he installed. After theft of lineman equipment from business and vandalism of his garden plants and flowersin June 1912, he reported strung his yard with wires charged with 3300 volts of electicity and posted a warning to potential trespassers in area newspapers. Politically, he was affiliated with the Republican Party. He was asked repeatedly to run for political office but he always declined. He did however serve for six years or three terms as the coroner of Morton County, North Dakota. He was also elected as president of the Mandan School district. Mr. Draper was also a Royal Arch Mason and a member of the Knights Pythias. After returning from an extended visit to his daughter in San Diego, CA, C. E. V. Draper died from heart failure at his home at 208 2nd Ave NW on June 8, 1926. His wife died in 1950. The couple, his parents as well as Mr. and Mrs. Rice are buried in Mandan Union Cemetery.